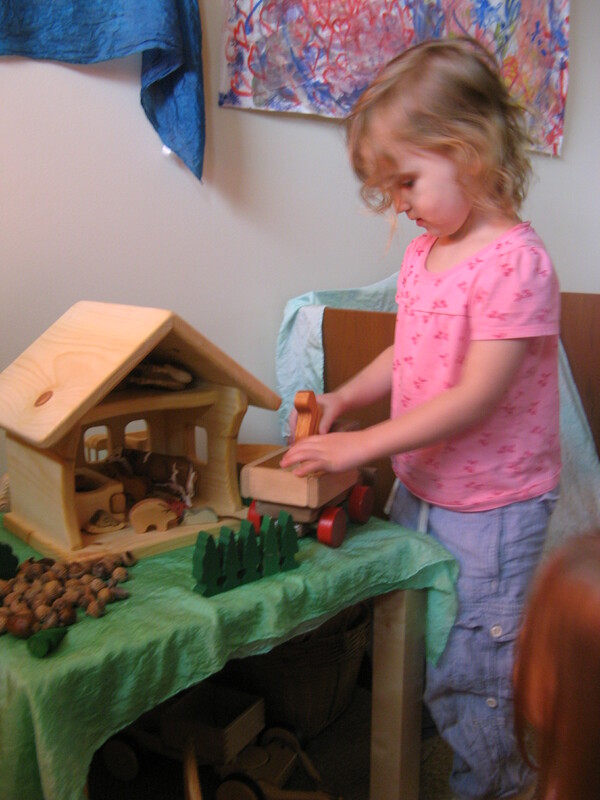 My students have been showing me that they are ready for smaller toys to channel their imaginative play. Often they want to explore gross motor play, where they build forts with cusions, tents with silks etc. 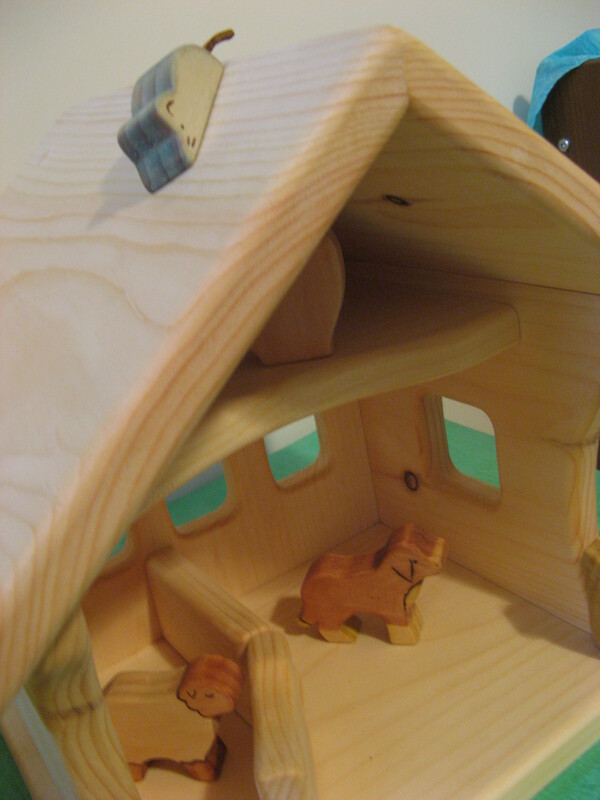 But sometimes I notice a real need for quiet fine motor play such as with a dolls house. II have been keeping my eyes open and fell in love with the work of Finns and Flowers. 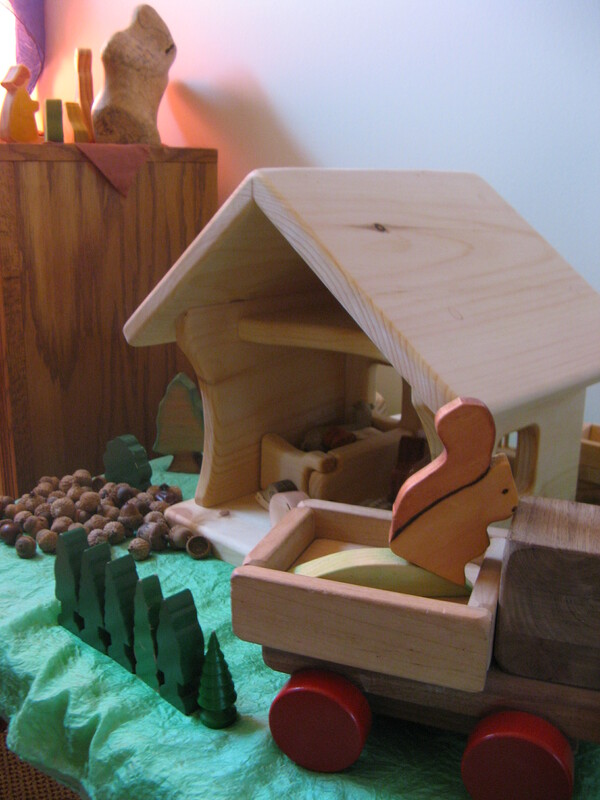 Their toys are very much in keeping with the aesthetic of our classroom and I finally chose their small barn, which I actually purchased from Bella Luna Toys. I have purchased from Sarah at Bella Luna before and she is so lovely to work with. Again she was great and really answered all my questions. My daughter fell in love with the cute little barn as soon and we got it out of the box. It was tough to get it away from her to get it to school – although she does get to play with it at school and isn’t it better to play with toys with friends! The barn is handmade in Maine from local and sustainably harvested wood. It is simple, yet truly beautiful. It even has a swinging gate! I was so excited to see how the children would interact with it. Before they arrived I set it up on a small table, covered with a green silk. I placed a few animals in and around it and then left a little basket of animals and trees on the floor beside the table. They were so excited. One girl came up to me during the mornign and said “It’s so beautiful. Is it really going to be here all day?”. I explained it was for the school and she could play with it every day. She had a look of shock on her face and then gave me a huge hug “Wow, that is so exciting” she exclaimed, and then ran off to tell her friends. I sat back and watched them play.